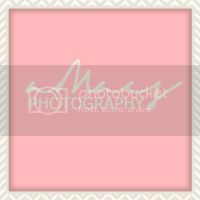 This Shop Dandy monogrammed acrylic jewelry tray is perfect for adding some personalization in your dorm room or apartment and also keeping your jewelry nice and neat! Tory Burch's Kerrington Square Tote is the cutest little bag to help carry books around campus or to simply look cute walking down the street! Bauble Bar teamed up with FRENDS to provide the cutest pair of headphones + earrings. The headphones are embellished to perfection via Bauble Bar so you can look super chic and trendy while you're walking around campus or around town listening to music. On the flip side, you can change out the headphone caps to have a more simple style. Super cool! These Warby Parker glasses are the cutest things ever and will make the grad look extra studious while study for those college final exams. You can never go wrong gifted makeup because it will always come in handy. We are currently loving tarte's 6 piece makeup bag equipped with makeup brushes, mascara, blush, eyeshadows, and more! There will be several moments post graduation where the graduate will have to get into business casual attire for a meeting, internship, or interview. This pink 'Molly' blazer from TOPSHOP is just the perfect gift to be worn for any professional occasion. Do you have some favorites?? 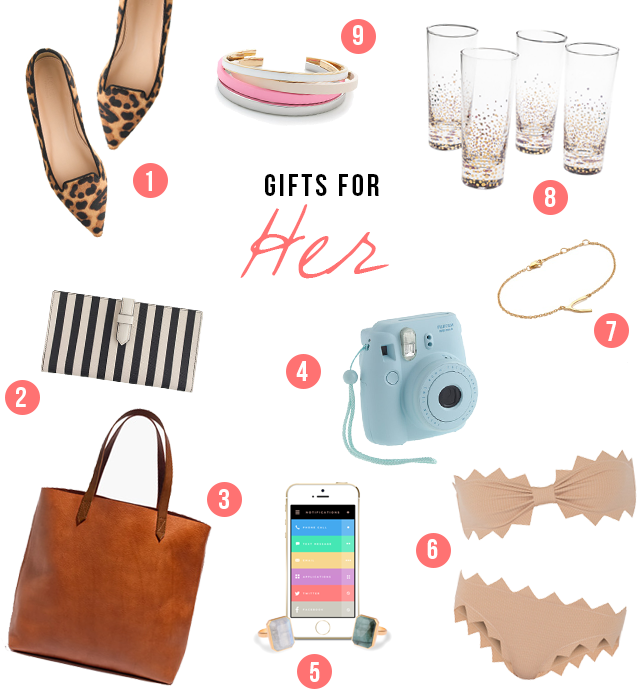 Yesterday, we shared a 'Gifts For Her' guide for all of our fellas, so today we are sharing a Valentine's Day 'Gifts For Him' guide for all you ladies (and gents) looking for a gift for your significant other. It's the little things that count with men we have found. Letting a guy know how proud you are to have someone like them in your life is a wonderful exchange of love. 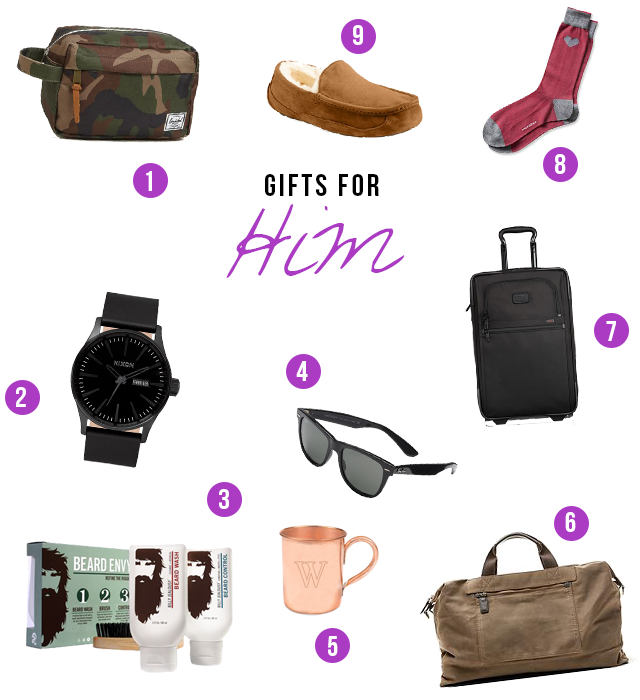 But, if you want to treat your man to a gift to show your love then shop our gift guide for him above! With men, it's all about simplicity and practicality. A trendy and sleek sunglasses or watch is never a bad thing as they can never have too many of those. Personalization is always a nice way to show a little extra care and creativity in a gift, which is why we absolutely loved the personalized Moscow Mule Mug from Nordies (Nordstrom)! See something missing from our list? Send us a comment below with your favorites. We love the month of love! Such a special time to let the ones you love know how much they mean to you. Whether it's a beautiful heartfelt card, a box of chocolates, a bouquet of flowers, or a special gift from the heart, there are endless ways to show your Valentine how much they mean to you. Today's post is for the fellas looking for some guidance on special things they can gift to their mother or significant other. Shop our suggestions and let us know what we should add to our list by leaving us a comment below! Father's Day is coming up in a few weeks (June 15th) and it's time to start thinking of what you should get your Pops. 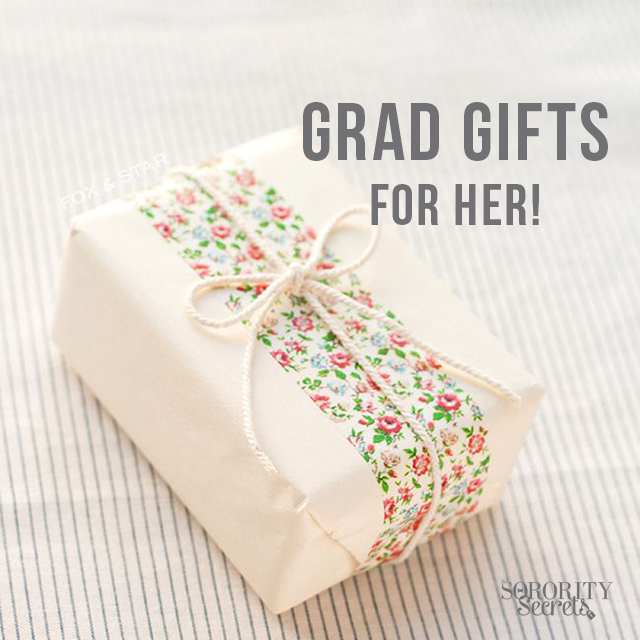 You don't want to give a boring gift, but you also don't want to spend too much money- so, once again, TSS is here to the rescue! Try getting him the new Google Chromecast or the Amazon Fire TV! They're both very affordable and mobile so your dad can take it basically anywhere. He will be able to watch his TV shows and movies from Hulu, Netflix, and Amazon Instant Movies so he can download the newest movie right away! Pretty cool, right? The one type of sunglasses that looks good on practically everyone and anyone, it would definitely have to be the Ray-Ban Classic Wayfarer. Sunglasses can be tough to buy for someone else, but with the tortoise Wayfarers, you can't go wrong! Who knew having a beard can cause dry and itchy skin? For all of the dad's that have a beard, you can't go wrong with getting him a good beard oil. The Blackbird beard oil is the newest "coolest" beard oil that is slightly scented with cedar and made with all-natural argan oil. The Swingbyte is the perfect gift for the techy dad that loves golf. The Swingbyte clips onto the golf club that syncs with the Swingbyte app to analyze your swing in realtime! It records the swing via bluetooth and gives you full online analytics so your dad can improve his golf skills! The Grillbot is exactly what it sounds like- it's a robot for your grill. Don't make your dad do all the hard work of cleaning the grill after he just made everyone a delicious meal! Just get him a Grillbot that will automatically clean the grill for him! If your dad loves to go to the lake or the ocean the SWIMS loafers are the best shoes you can get your Pops! These are the perfect waterproof loafers that your dad can wear practically everywhere and anywhere and still stay stylish, of course. You can never go wrong with a good traveling bag. The Filson travel kit is the perfect little bag for your dad to carry and protect all of his important items. Whether it's his passport or his toiletries, it's the perfect classic bag that your dad can use all the time! 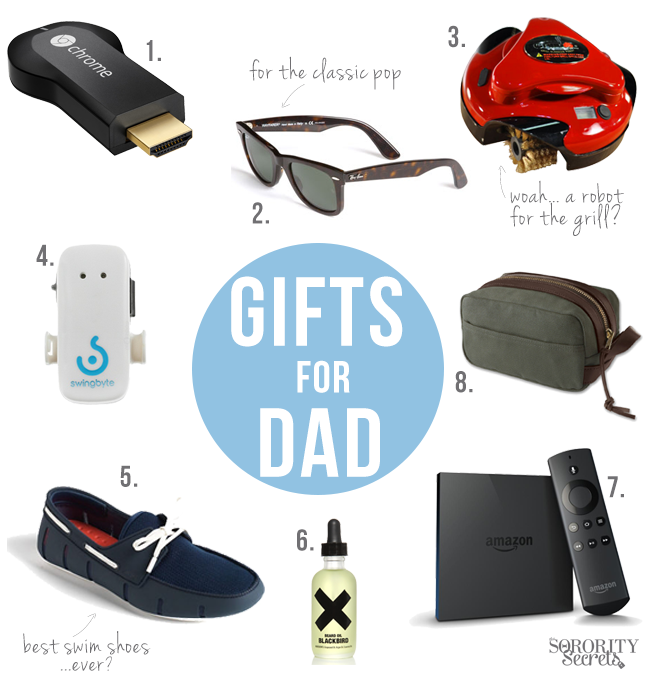 What are some of your other Father's Day gift ideas?? Whether it's a gift for your boyfriend, brother, or dad- buying a gift for a guy can be a tad bit tricky! 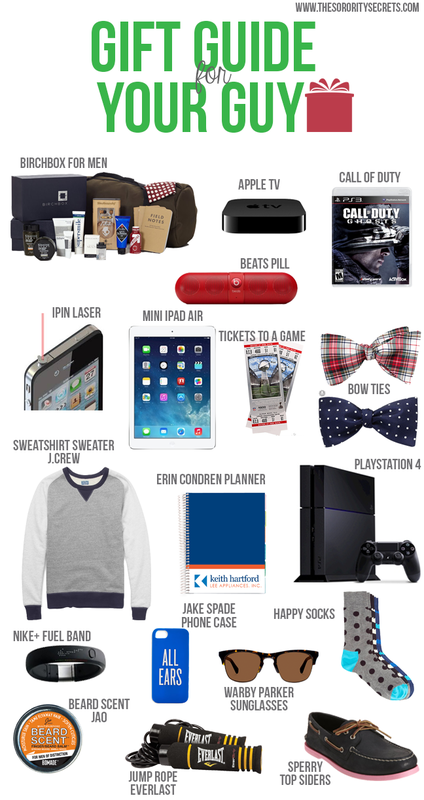 Throughout the years, we've all gotten pretty good at selecting gifts for the guys so we thought we would create a "2013 Gift Guide for the Guy" list! We have presents that are suitable for everyone! 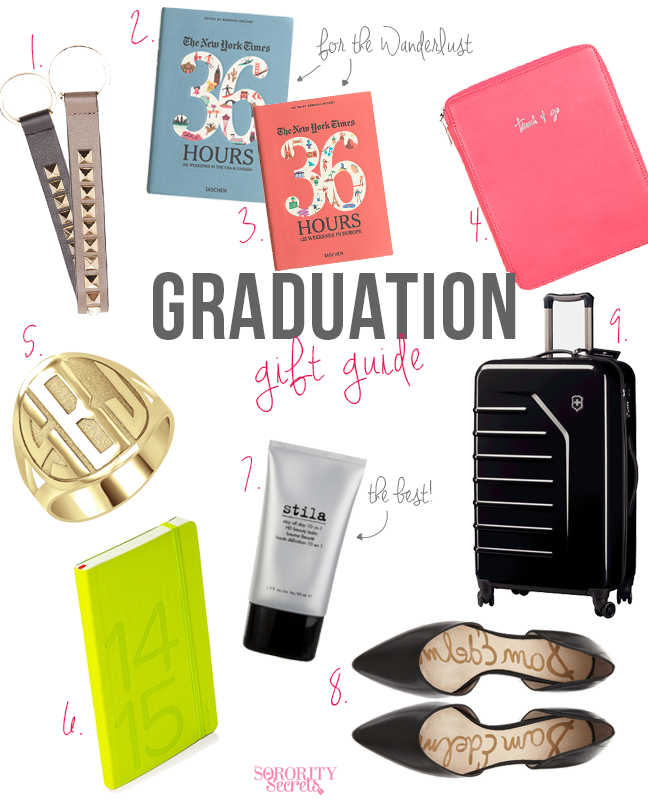 Check it out and if we missed any great gift ideas, share them with us by commenting below!